The day we fried fish, I invited Mom over to eat with us. Because we Southerners don’t go anywhere without bringing food, she brought this cake. The recipe copy she had indicated this was a Pampered Chef recipe, though my search of their website found no such recipe. I don’t know who to credit for the recipe, but I’ll credit Mom for this photo because she cooked the cake. And it was ta die for! Beat filling ingredients until smooth and set aside. Combine cake ingredients and mix according to package directions. Spread 2 cups cake batter into greased and floured bundt pan. Spread filling on top. Pour in remaining cake batter. Bake at 325 degrees for 50-55 minutes or until cake tester comes out clean. Cool 10 minutes in pan, then cool completely on cooling rack or serving plate. Bring corn syrup and whipping cream to a simmer over medium heat, stirring constantly. Add semi-sweet chocolate and stir until smooth. 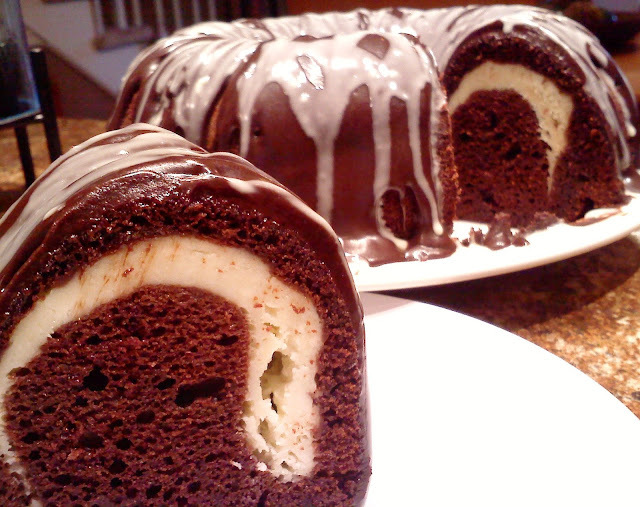 Drizzle glaze over cake. Refrigerate for 15-20 minutes before adding drizzle. Microwave then stir white chocolate and oil at 30-second intervals until smooth and melted. Stir in extract. Drizzle over cake. Refrigerate for 15-20 minutes. Remove cake from refrigerator and store at room temperature until ready to serve. Oh my word, this recipe looks sinfully delicious! Thank you (I'll tell mom too)! It's really worth the effort! GOING TO TRY THIS FOR SURE WITH GRAMPS HELP. This is definitely a dream cake! Looks really delicious. It feels like I'm living in a dream when I saw this.